BitRate II from Icebreaker Audio uses multiple methods of retro digital synthesis and sampling to produce charismatic and nostalgic drum sounds, making it a powerful drum machine software. The included sound engines from this Reaktor drum machine cover chipsounds, FM synthesis, lofi sampling, and glitchy circuit bending. On top of these unique sound engines, Icebreaker Audio's BitRate II is a drum machine VST that also offers a 5-track mixer and a master FX section that includes an analogue modelled EQ, bus compressor, and speaker simulator for added lo-fi effect. The Reaktor drums can be triggered via MIDI or from the internal sequencer. The sequencer provides two modulation sequences per drum, which can be routed to virtually any combination of sound parameters in any amount. BitRate II also comes bundled with the MonoBoy instrument, a melodic counterpart for BitRate II. MonoBoy is a Reaktor synthesizer that uses similar sound engines, but in an interface more suited to melodic playing. MonoBoy's key Reaktor synthesizer features include 3 sound generator modes (a unique DM sampler, easy-to-use arpeggiator, and Voice Controls), 2 Modulation sequences, and a master FX section that includes the one-of-a-kind Bit Delay effect. 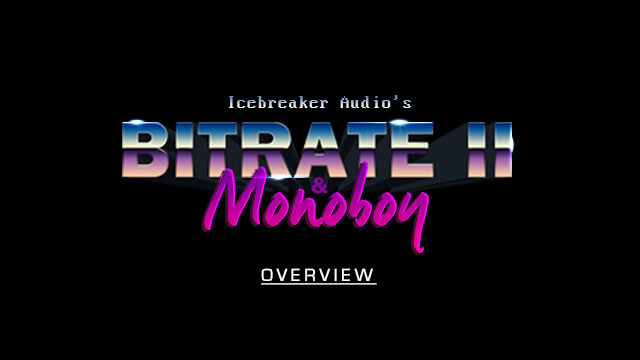 BitRate II & Monoboy were created by Icebreaker Audio, the brainchild of Adam Hanley, whose name appears in the credits of many high-profile Kontakt and Reaktor products, working on anything from African drums to additive synthesis. He is also responsible for the Kontakt scripting here at Heavyocity, pushing the platform to the limit in order to bring even the craziest of ideas to life. Icebreaker Audio was created in 2011 as an outlet for boutique product concepts and personal obsessions. BitRate was born out of years of R&D into chiptune music, vintage digital electronics, and circuit bending. BitRate II takes the original concept even further, while also refining the workflow to create something both versatile and full of character. Reaktor or Reaktor Player (version 6.2 or later) required. Heavyocity had one goal in mind when they set out to create NOVO: “make strings new again.” Recorded at the famous Eastwood Scoring Stage at Warner Bros. Studios, of course NOVO is a world-class, deeply-sampled orchestral strings instrument. But that’s where its similarities to other orchestral VI’s end. Imagine the possibility of almost 40GB of superior orchestral strings fused with Heavyocity’s signature sound design; it’s a new frontier in hybrid film, game, and television scoring.